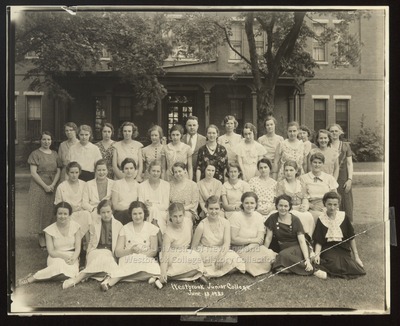 "Students and Teachers, Westbrook Junior College, June 13, 1933"
Westbrook Junior College students and teachers pose together on the campus Green with Hersey Hall in the background in this 1933 black & white photograph. Teachers are in the back row on either side of Dr. Milton D. Proctor, who became president of the junior college in 1933 when the student body numbered 27. Within a year it grew to 76 and to 128 in 1935.